Composed by the 12th-century Sanskrit poet Jayadeva, the Gitagovinda describes in impassioned verses the love between the god Krishna and Radha, his favoured consort among the gopis or milkmaids of the Braj country near Mathura. The dispersed series to which this page belonged was the first commission carried out by Sahibdin as court painter to Maharana Jagat Singh I of Udaipur (r.1628-1652). In successive scenes, Radha describes to her sakhi (companion or confidante) how Krishna converses with her, embraces her, adorns her braided hair with flowers, and makes love to her. 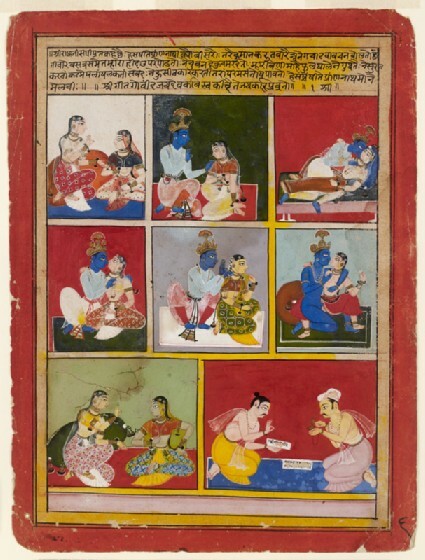 Yet the text may suggest, unconventionally, that Krishna is all the while confusing Radha with her sakhi, with whom he is currently enamoured. 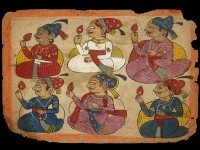 Below, the poet Jayadeva is shown reciting his verses to the accompaniment of cymbals.